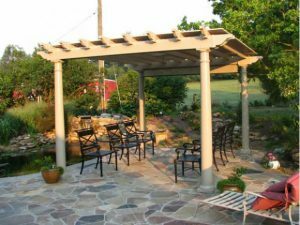 A pergola is a garden structure that forms a shaded walkway or a sitting area of vertical posts or pillars that usually support cross-beams and open lattice, often upon which woody vines are grown. Pergolas were first mentioned in an Italian writing in 1645. 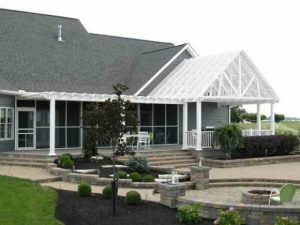 Pergolas may connect pavilions or extend from a building. 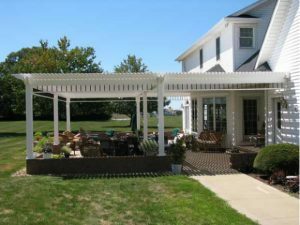 Free standing pergolas provide a sitting area that allows for breeze and sunlight but offers protection from the harsh glare of direct sunlight. Pergolas can be made to any size or height. 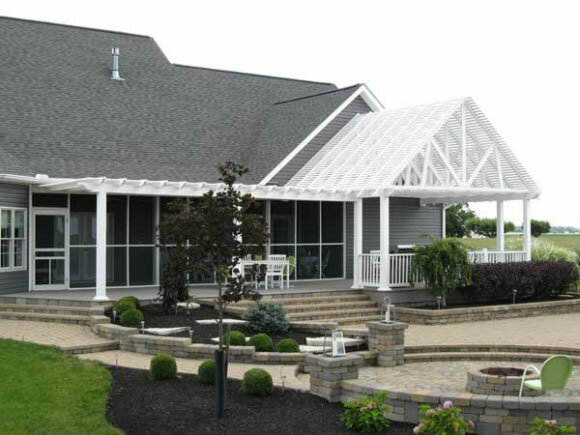 Vinyl pergolas are constructed 100% of low maintenance light weight poly vinyl that will stand up to the elements for a long time. A vinyl pergola provides a stunning backyard centerpiece. All vinyl materials have a lifetime guarantee.